Humankind enjoys their privacy. When you look at our sociology, we have been building homes and fences to secure our boundaries. Despite this reason, there are other reasons to create private pools and generate innovative pool landscaping ideas. Many people do not like to put themselves on display, each time they are done with their swim. Well, if you are among these people, this blog is a must read for you. We have helped many of our clients in improving the privacy of their outdoor living, without creating concrete walls around it. We have taken up a different approach and come up with natural solutions for building pool privacy in your backyard with the help of some easily available plants and trees. Make your poolside ambience a comfortable one with by incorporating the following plants in your pool landscaping ideas. Plants that you should pick. These plants are mostly no nut or non-fruit bearing. You can also choose a dwarf version of these plants or can make a plant dwarf on its own with artful pruning. Remember to place the plants in a suitable distance that allows them to grow healthy. You can pick hydrangeas, boxwoods, shrubs and euonymus to fill in as the shorter, softer grass. Hydrangeas grow quickly and so can fill the lands quickly and also adorns beautiful flowers. Also, these plants are easy to maintain and look lovely. You can also pick unconventional hedges of grasses as some grasses grown up to 1 to 2 meters in height. But for houses with children, tall grasses aren’t really a right option. These grasses are pointy and can scratch the tender skin easily. If you still wish to have them in your backyard, you should avoid planting them around turns and walkways. If you have a chain link fencing around your backyard, then consider filling it up with non-fruiting perennials and vines. Such perennials vines include climbing hydrangeas, Dutchman’s pipe, and clematis. These trees or shrub hedgings can allow you private grounds around a pool with not much of maintenance. These trees are nut or fruit bearing and so can make your pool experience messy while inviting many furry animals to your pool. Select evergreen plants: They will provide you with year-round interest, even when the pool is closed. Choose shrubs and trees with minimum litter: Falling or decaying of organic materials will leave your hardscape features stained. Avoid having dark-coloured pavements: Darker colours soak more heat and can damage the plants. Thus, try picking light coloured pavements. 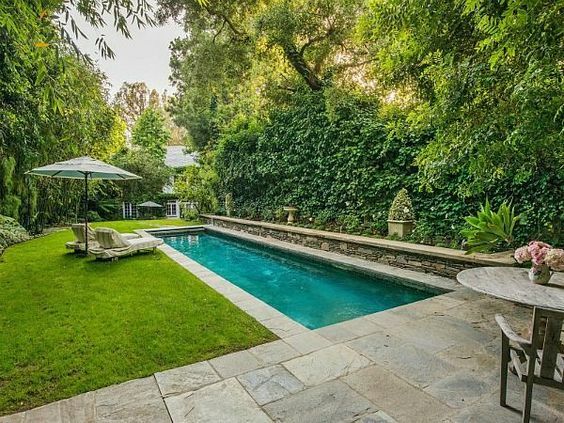 Private Pool Landscaping Ideas For Your Home! Still confused about choosing the right plants or trees to develop innovative pool landscaping ideas for your home? Contact Land-con! With more than 20 years of experience, our large and small pool backyard pool landscaping ideas and services are exceptional in Toronto. Call us at 416.504.5263 and ask for a free consultation!